Produced by the EMPEA ESG Community, the report investigates the role private equity investors can play in meeting the U.N. Sustainable Development Goals, a global framework for addressing the most urgent global social and environmental challenges. Meeting the SDGs will require more than US$5 trillion in annual investment. Only a small proportion of this will come from public funds and development aid, leaving an investment gap in developing countries of around US$2.5 trillion. 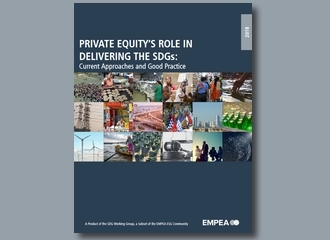 The private sector has a critical role to play in achieving the SDGs, and private equity (PE) investors are in a unique position to invest in and influence businesses in a manner that creates positive change. The report features several case studies with stories contributed by members of the EMPEA ESG Community, to provide examples of how GPs are aligning their portfolio companies and funds with the SDGs and what metrics they are using to gauge compliance. • Exploring investment strategies that specifically aim to achieve SDG targets. Investors also face common challenges when engaging with the SDGs given the breadth of the SDGs, underlying targets and key performance indicators (KPIs), all of which are set at a national level and may not translate easily to a specific investment. EMPEA is an independent, non-profit organization for private capital in emerging markets. The association’s membership comprises 300+ firms representing institutional investors, fund managers and industry advisors who together manage more than US$5 trillion in assets across 130 countries. EMPEA’s members share the organization’s belief that private capital is a highly suited investment strategy in emerging markets, with a unique ability to deliver attractive long-term investment returns and promote the sustainable growth of companies and economies.